Why choose Bosch? The security industry is changing with new technologies, the influence of IT, more sophisticated end-users, and increasing competition. At Bosch Security Systems design, innovation and quality are a constant priority. Our investment in research and development is unsurpassed in the security industry. FPC-500-4 Conventional Fire PanelHigh-value modern optics – suitable for public access areasPlain te..
FPC-500-8 Conventional Fire PanelHigh-value modern optics – suitable for public access areasPlain te..
FPC-500-RLYEXTRelay Extention Module for FPC-500For FPC-500-4 max 1, FPC-500-8 max 2BOSCH Authorized..
FPA-1200 Fire PanelEasy upgrade to 2 loops by second LSN 0300 A moduleConnection of u..
FCH‑T320 Heat Detector No. Tipe Komersial FCH-T320 No. Produk F.01U.026.291High reliabilit..
FCP-OT320 Multisensor detector optical/thermalHigh reliability of detection thanks to evaluation ele..
FCP‑O320 Optical Smoke DetectorNo. Tipe Komersial FCP-O320 No. 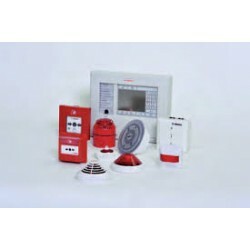 Produk F.01U.026.293High reliabi..
D296 Smoke detector, long-range beam 24VOperates over distances between 30 ft (9 m) and 35..
FMC-120-DKM-G-R Manual call point indoor, redAdjustment of the manual call point after alarm trigger..
FNM-320LED-SRD Sounder with LED, surface-mount, redVolume up to 112 dB(A)Can be used in adverse envi..
FNS-320-SRD Beacon, surface-mount, redCommercial Type No. : FNS-320-SRD Product No. : F.01U.143.8..
MB-G6-24-R Motor bell, 6" 24V, redCommercial Type No. : MB-G6-24-R Product No. : F.01U.002.279Hig..
FAA-420-RI-ROW Remote indicatorCommercial Type No. : FAA-420-RI-ROW Product No. : F.01U.289.12036..